Rheumatoid arthritis: it significantly reduces the inflammatory interleukin -6 markers, suggesting regular turmeric ingestion could prevent the onset of RA. Depression: Research from the Government Medical College in India provides first clinical evidence that curcumin may be used as an effective a safe modality for treatment in patients with Major depressive disorder. In the study patients were treated by curcumin and compared against treatment with Prozac. They discovered the curcuminoid compound is not only as effective as Prozac in managing depression; it doesn’t carry all the dangerous side effects. Diabetes: Turmeric is shown to lower blood glucose levels and reverse insulin resistance! Cancer: recent studies show turmeric has the ability to inhibit cancer cell growth, boosts antioxidant levels and improves immune system. Skin and aging: its strong anti-inflammatory properties reduce redness and other skin irritations. Its antibacterial qualities make it great for blemishes, acne and improving skin texture and balance. Brain health and memory: by taking turmeric, you can improve the oxygen intake of the brain, which helps with memory function. Oil form: ½ tablespoon of turmeric oil 3x daily. 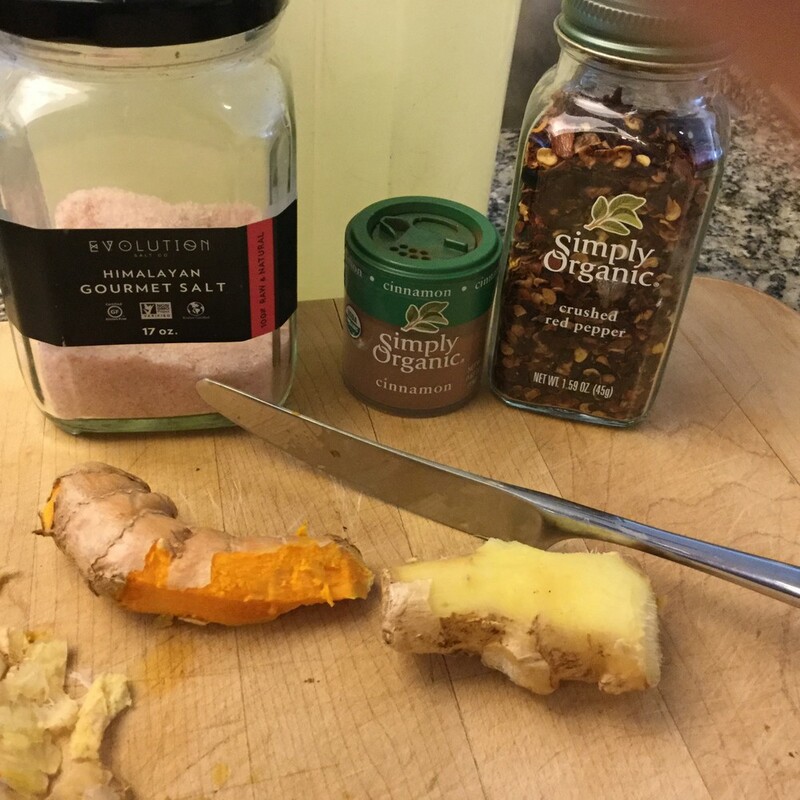 GINGER has some crossover health benefits but I particularly like it in the winter for its warming quality. Improves digestion and increases absorption of food. Ideal for when you are feeling bloated or have eaten too much. Reduces inflammation making it an ideal remedy for overworked muscles and joint problems. Relieves congestion associated with the common cold and environmental allergies. Improves blood circulation, therefore decreasing the chance of cardiovascular problems. Relieves menstrual cramps. Try consuming and soaking a towel in the ginger tea and applying it to your lower abdomen. Relieves stress through the calming properties making it a great nightcap. Best way to peel ginger and turmeric is use the blade of a dinner knife and scape the delicate skin. Then mince both. Bring water to boil then add all ingredients. Simmer 10-15 min on med low heat scraping sides regularly. Allow to cool then poor through a mesh strainer. serve: sliced oranges, lemon juice, honey, mint.